Unlike father Rajiv Gandhi and brother Rahul Gandhi, Priyanka Gandhi has to wear two crosses — the Gandhi dynastic cross and the Vadra controversies cross. The second hurts more. The haste with which the Government has opened the Vadra can of worms points to the viciousness of today’s politics. But the worms cannot be wished away. We have a tradition of leaders allowing family and friends to influence policy. It began with Jawaharlal Nehru himself whose private secretary, M.O.Mathai, was the source of much evil. Prime Minister Morarji Desai, considered a paragon of virtue, allowed son Kanti to sit in the PMO and influence decisions. P.V.Narasimha Rao hit a new low lending his ears to the international fraudster Chandraswamy. A.B. Vajpayee was supposed to usher in a new era, but he had a “foster son-in-law” who enjoyed official protocol status even when the Prime Minister went on foreign visits. There are sons and relatives getting special status under the present BJP rulers as well. The problem therefore is not confined to one party or one leader. It looks like an implant in the DNA of the Indian politician. K. Chandrasekhar Rao and N. Chandrababu Naidu, sworn enemies, have both installed their sons as key Cabinet Ministers. Deve Gowda, with a son as Chief Minister, is grooming a grandson for Prime Ministership. Even “singles” like Mayawati and Mamata Bannerjee have nephews throwing their weight around. For us politics is a blood thickener. In such a situation, it is perhaps unfair to single out Robert Vadra for special mention as an offender. Besides, the present Government’s hypocrisy is too blatant to be missed. Accusations against Vadra were publicly aired during the BJP’s election campaign back in 2014. Though the party came to power, they took no follow-up action against Vadra for five years. Suddenly, the day Priyanka took charge as Congress Secretary, the Government got into action. What explains the coincidence? The people know even if the ruling party thinks that they are dumb. And, pray, who is looking into the misdeeds of Vadra? The Enforcement Directorate, one of the many supposedly independent agencies that have lost their credibility in toto. This of course is not a new development; all parties in power have made a mockery of all agencies. But no one has done it with the rascality, the sinfulness and the in-your-face arrogance of the present regime. Things have reached a stage where an investigation by RAW, IB, CBI, ED etc. spreads the impression that the citizen investigated is innocent and is merely being harassed for political purposes. This would be ironic in Vadra’s case. Transgressions attributed to him stretch from family affairs (his father was “disowned” by him and a few years later was found dead in what was first described as a heart attack and later as a suicide) to his posturings as a political leader. He led a farcical motorcycle rally in Rae Bareli in 2004 and declared, even more farcically, “if people want, I can join politics.” On the day Priyanka went to take charge at the Congress office, a poster appeared there featuring him with her. It was quickly removed by an embarrassed Congress. A smart ED will leave him alone so that he can continue embarrassing his wife and her party. Evidently this guy is an untamed horse. The first rule about wild horses is that one must approach them with caution. The texts say: “Ritual posturing and snorts often resolve a confrontation, but fighting does occur.” By interfering, the agencies of a spiteful government can achieve nothing and lose much. Perhaps the Government’s strategists think that a Vadra hullabaloo will divert public attention from issues that matter, such as rising joblessness, farmers’ distress, destruction of small business through demonetisation, the rise of fringe elements with freedom to lynch and so on. This may be true up to a point. But the desperation with which such tactics are resorted to also suggests that the ruling dispensation will stop at nothing. The suspicions over voting machines, for example, may not be out of place. In the 2014 elections the present Prime Minister had acknowledged the importance of the Election Commission. “With full responsibility,” he told a rally in UP then, “I am accusing India’s Election Commission of discrimination.” The rest of India has been making the accusation from the opposite side of the ring this time. 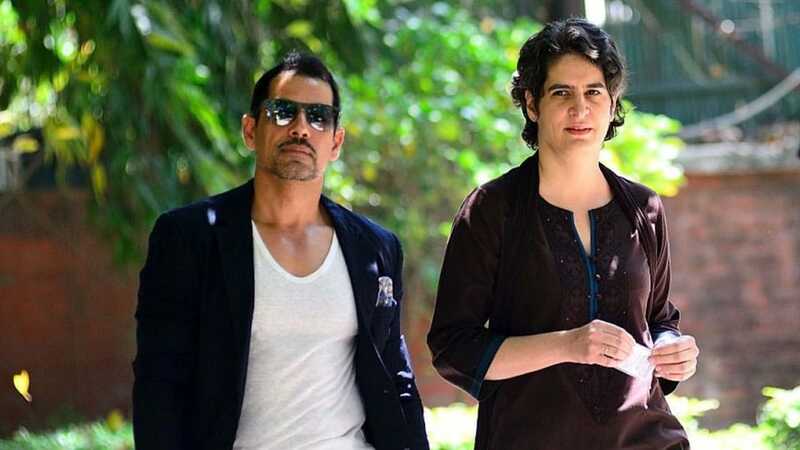 Hullabaloo about Vadra’s vagaries and Priyanka’s looks is a way to outshout others. Clearly this is going to be an anything-is-possible election. Politics has never been this dirty in India. What ever TJSG writes giving justification and try to stand with Robert Vadra…. nation will vote for NaMo only… NaMo well deserves a second term in his office…!!! Their pair is like beauty and the beast… He looks like some B-grade movie villain. mr george says’politics was never so dirty in india’ obliquely saying that bjp has made politics more dirty.mr george should know that politics has allways been very very dirty in india.has he forgotten what indira did to her rivals, what she did to our own devaraj urs? emergency is a totally different matter which was not only dirty but very very scary.what about mulayam,lalu,mayavati who is clean? Though an utter misfit Rahul masquerades like a power hungry beast.His insensitive outbursts referring to Rafael deal and targeting Indian air force pilots are unbecoming of a people’s representative.The Congress party’s expectations that Priyanka’s plunge will give a great boost to it’s electoral fortunes are not at all realistic.This is because she is greatly handicapped by serious allegations of corruption against her husband Robert Basra which are under scanner in various stages.